Saturday is my grocery day… I bought things this week that I didn’t last week. This is pretty much my grocery shopping mantra. I don’t do lists unless I ‘need’ something thats a staple… e.g. olive oil or onions. I like walking through the produce section and seeing what looks good that I didn’t get last week, this way I’m know I’m getting a variety of foods all the time. Breakfast: A Fuji apple + Coffee. 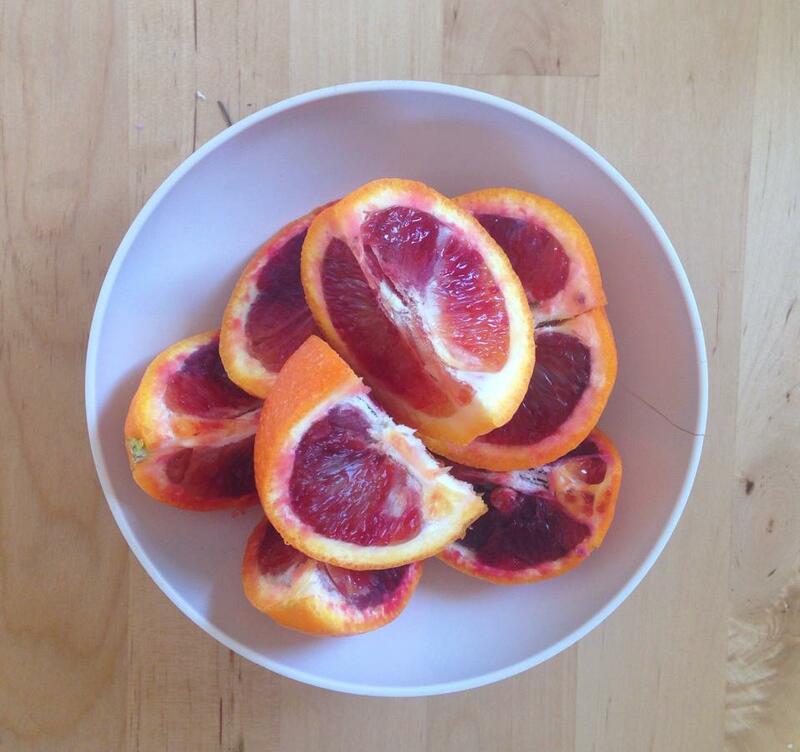 Lunch: My famous MUSH to finish up the leftover veggies with a side of a couple blood oranges. 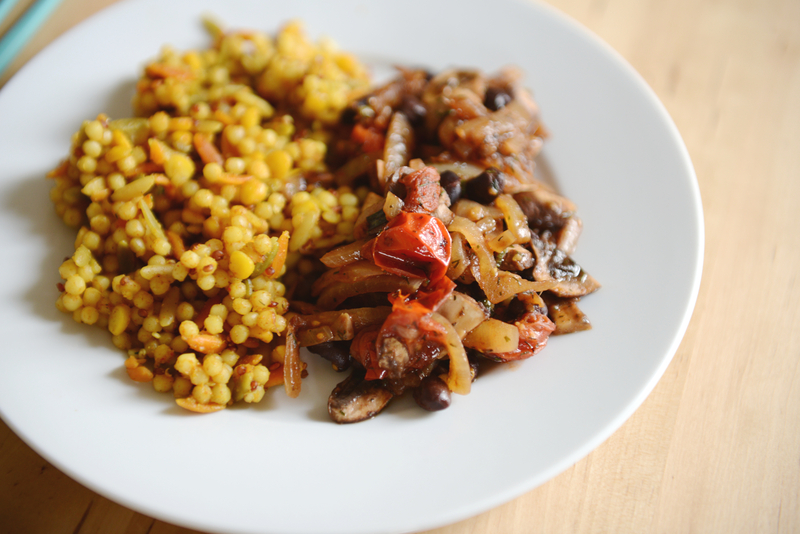 Left: Israeli pearl couscous medley with baby garbanzo beans and orzo cooked with smoked paprika and cayenne pepper. Right: Simple veg. 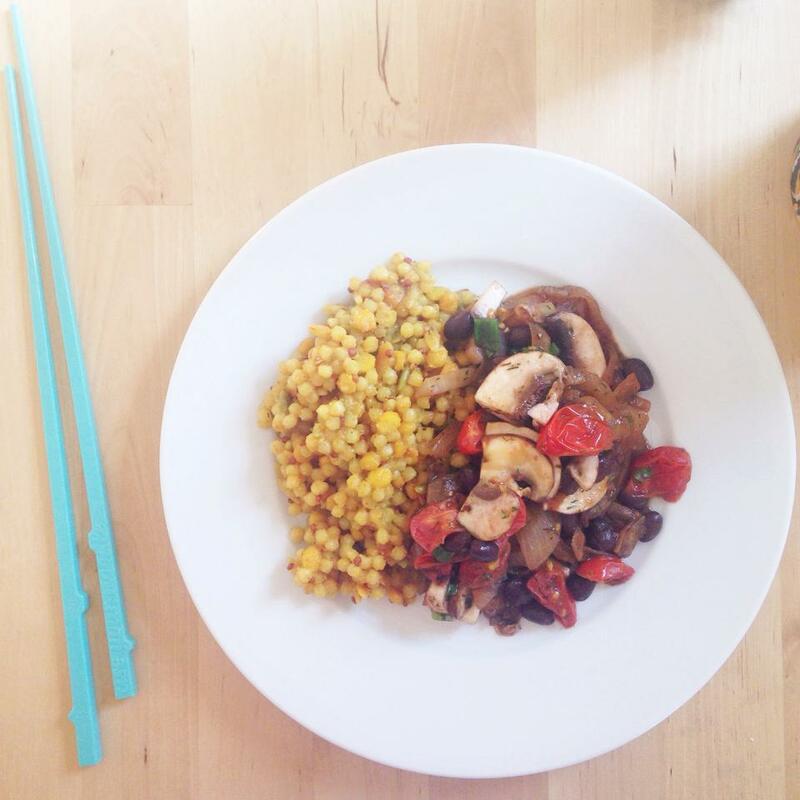 medley – browned onions, baby bellas, cherry tomatoes, beans, and green onions sautéd in soy sauce. 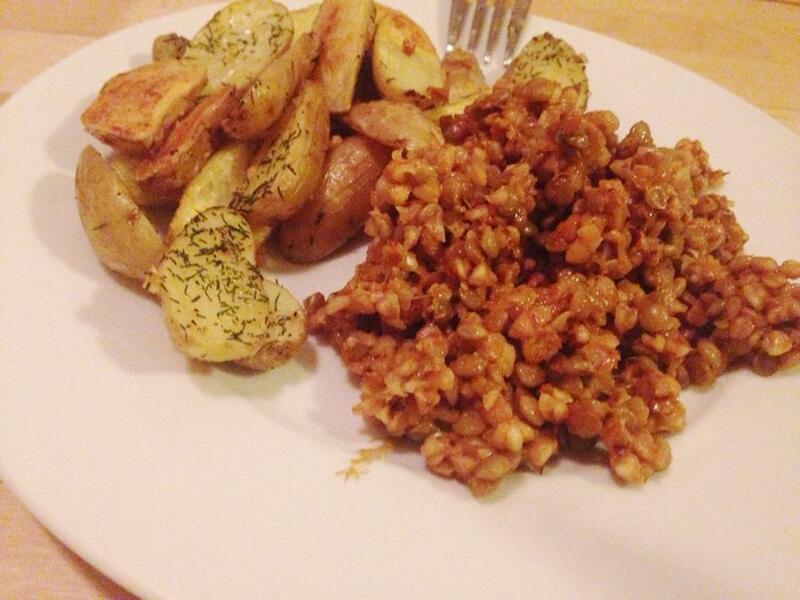 Roasted truffle, garlic & dill fingerling potatoes with hot (red chili peppers) & cheesy buckwheat lentils (just cook buckwheat and lentils separately, combine and add shredded mozz). Late night snack with friends: Flax seed chips with TJ’s Spinach dip… this was probably a little extra. This is my version of broccoli fried rice… only I make it Broccoli fried pearl couscous (a kind of pasta made with whole wheat). 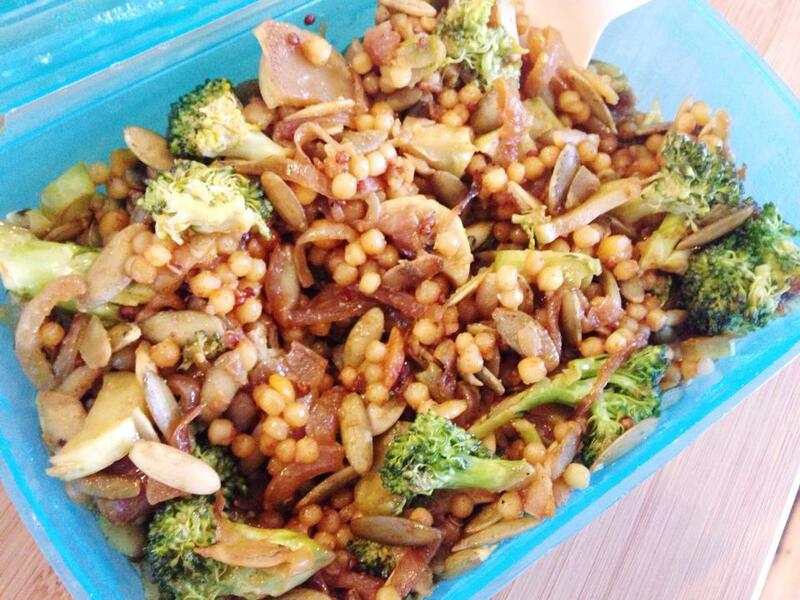 [browned onions in a red chili sesame oil, broccoli sautéed in soy sauce, pearl couscous, baby garbanzo beans, orzo, and raw pumpkin seeds] I made a giant portion of this and had leftovers for days. My current breakfast go-to. 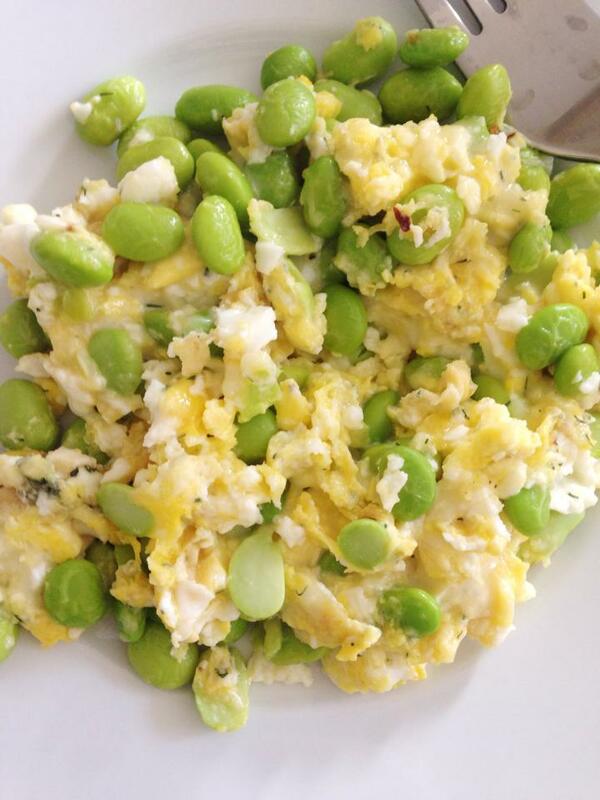 Cheesy (mozz) scrambled eggs and edamame. Dill weed for flavor. All in all I succeeded in not going out this week. Just Monday dinner at La Esquina where I met up with some old friends. I had a chicken milanese sandwich. It was alright. Not bad… I should know better than to order sandwiches seeing as how I’m not a big fan. The large layer of melted fresh mozz was the best part. Next week I’ll do better. I promise. 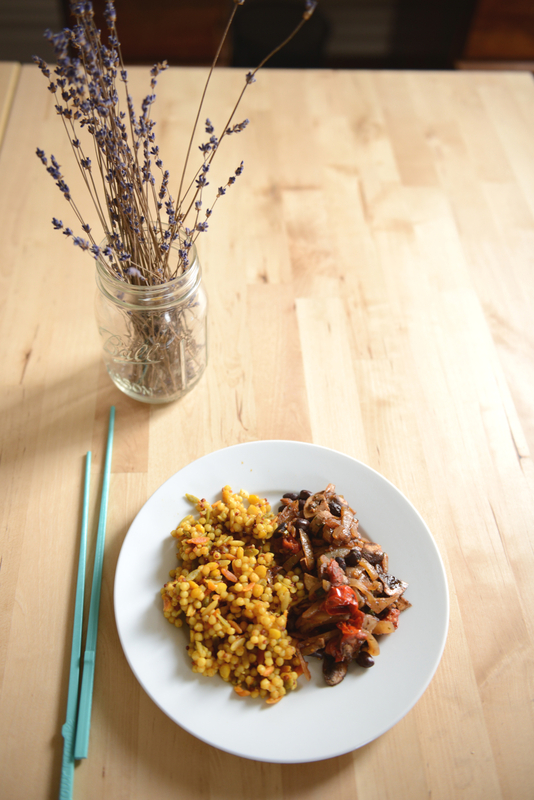 Do you have any fun easy meals that you want to share? Please do! Next Week 38: Bluegrass, A Hungry Rat, & Christina Bianco.